It is now the countdown to Christmas which is a terribly exciting thought. A guilt free month of over indulging, merry parities, far too much bubbly, but also generosity and kindness, we love this month. Although weeks away we are already planning the Christmas day feast, getting the orders in and thinking about decorations. We have come up with a Tarty take on the festive spread - each week from now till Christmas we will be giving you a new dish (with 4 in total) to help with your festive entertaining. We love the traditional Christmas roast but this is a fun twist with on the old classic, dishes that you will be able to use throughout the year as well as on the big day. The great thing about all the dishes is that they can all be prepared in advance, this is crucial for Christmas day as the last thing you want is to be bound to the kitchen all day. We have gone for a Middle Eastern vibe for our spread this year, using wonderful fragrant spices, colours and textures. 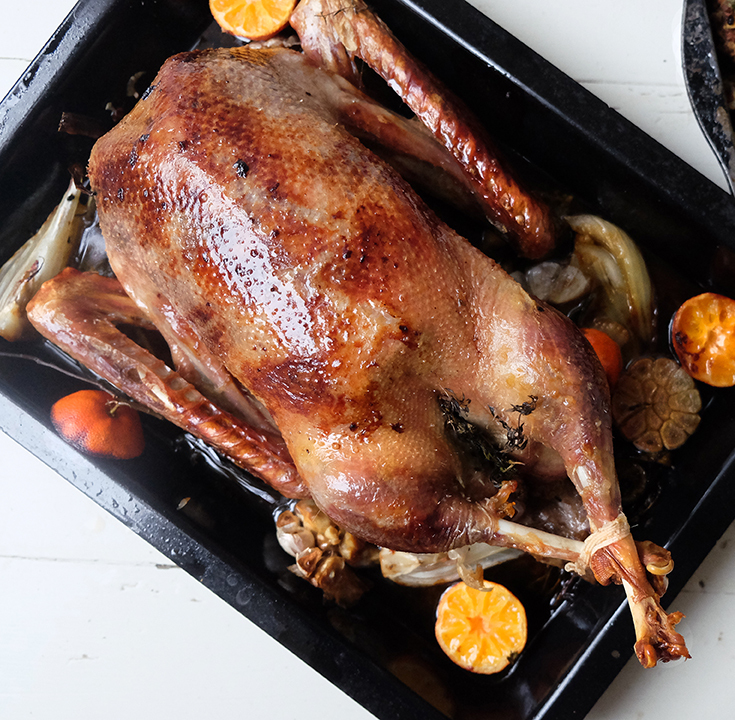 First and foremost is the bird itself, we have gone for a roast goose which feels like a real treat - rich, golden and succulent slowly roasted with clementine’s, fennel and bay with a spiced chestnut and barberry stuffing. You want to snuggly fit the clementine’s, garlic and fennel around the bird which flavour the fat that you will use to baste the bird and adds a wonderfully Christmas flavour. A goose is quite a fatty bird, if you can save the fat for cooking the roast potatoes its beyond delicious, its actually how we always cook our roasties – if you are not cooking goose then we would recommend buying goose fat from the butchers, or the supermarket – put a good spoonful on a tray and heat in the oven then tip in the pre-boiled potatoes and roast for the perfect potato. Another tip for cooking potatoes is after you have drained them put them back in the pan and give them a good bash about, this helps them to go devilishly crisp around the outside and soft and fluffy in the middle. Unlike chicken or turkey a goose can be served slightly pink, but its tricky cooking the legs without over cooking the breast. Most suggest to take the legs off to cook separately, but this slightly takes away the wow factor of the bird, so we suggest slow cooking it and actually the thick layer of fat should stop it from over cooking. Cooking times are approx. 30 mins for every kg. 1. Heat oven to 180c. Place the goose on a rack in a large roasting tray. The rack wants to be risen from the base of the tray so the fat can drip into the tin. Stuff the cavity of the goose with thyme garlic and bay. Loosely wrap the foil over the bird and place in the oven for an hour. 2. Meanwhile make the stuffing. Heat a little oil in a small pan over a medium heat, add the onion, garlic, ginger and cumin seeds and saute for 5 minutes. Take off the heat and place in a mixing bowl with the rest of the stuffing ingredients. Season with salt and pepper, and poor out into a roasting tin, place in the oven and cook for 20 minutes till cooked through and golden on the top. Take out, cover with tin foil and keep warm till needed. 3. After the goose has been cooking for an hour take out the oven and lift off the rack and place to one side. Pour out the fat and keep for making roast potatoes. Remove the rack from the tray and place the bird back in the roasting tin surrounded with the fennel, clementines, garlic, bay, thyme and white wine cover with tin foil and place back in the oven. Cook for another 30 mins, then remove the foil and cook for another 30. Remove from the oven and leave to rest for at least 20 – 30 minutes. Serve the goose with the stuffing and other festive sides.